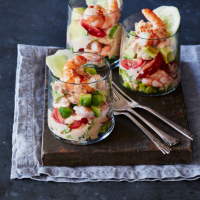 The secret to a brilliant seafood cocktail is not only homemade mayonnaise (which is essential), but also chopping all the ingredients evenly and finely so it’s easy to eat. 1. Mix all the ingredients for the cocktail sauce together; season and set aside. 2. Reserve 4 prawns to garnish, then chop the rest into bite-sized pieces. Mix the crab meat with 1 tbsp cocktail sauce. Assemble the remaining ingredients in 4 glasses or bowls, layering them up as you like, with a little cocktail sauce in between. Garnish each with a whole prawn and sprinkling of paprika.